The Advanced Templates provide great flexibility for customizing the Advanced Form. However, a common problem when using the AdvancedInsertTemplate or the AdvancedEditTemplate is that the functionality related to recurrence and resources is lost. In other words, if you chose to customize the advanced form you will not be able to insert or edit recurring appointments or appointments with resources, unless you implement this functionality from scratch. For instance, consider the Templates online example. The solution which we offer is a set of user controls that recreates the default advanced form, yet allowing for unrestricted customization. We will show how to use the advanced form controls in both Server Side and Client Side binding scenarios. For an online demo, please see the Advanced Templates example. 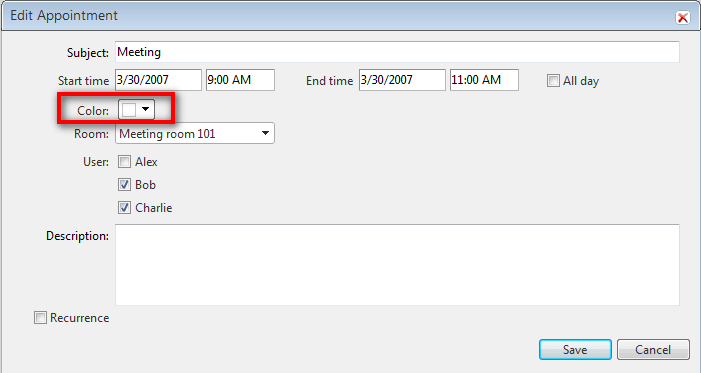 Our task in this tutorial will be to understand how the RadColorPicker control was added to allow to save the selected color in a custom attribute and apply it to the appointment in the AppointmentDataBound event. 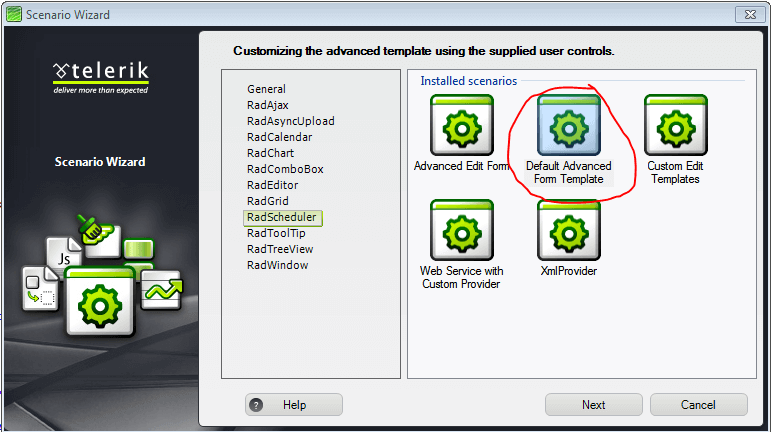 Open the Advanced Templates demo locally. <telerik:RadColorPicker RenderMode="Lightweight" ID="AppointmentColorPicker" CssClass="rsAdvResourceValue" NoColorText="transparent" ShowIcon="true" PaletteModes="HSV"
Expose an AppointmentColor property using the RadColorpicker control added in step 2 above. <telerik:RadScheduler RenderMode="Lightweight" runat="server" ID="RadScheduler1" Width="750px" SelectedDate="2009-03-30"
Register AdvancedForm.jswith the script manager for the page and handle RadScheduler's OnClientFormCreatedevent. This is actually already done in the sample demo. This step is to serve just as a reminder. Run and test the application. If you experience problems, please refer to the Modified_AddedDescription folder for a solution. 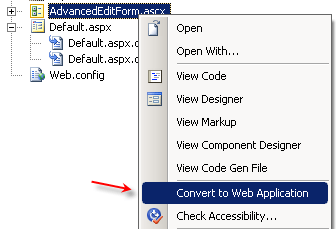 The AdvancedForm.js will automatically handle resources and custom attributes defined in AdvancedForm.ascx, as long as you follow a certain naming convention. Download a sample project from here. In RadSchedulerAdvancedForm.aspx add AppointmentColor custom attribute for RadScheduler -CustomAttributeNames="AppointmentColor"
Add a method to save the RadColorPicker's selected color to the AppointmentColor custom attribute. Run and test the application. If you experience problem, please refer to the sample in the Modified_AddColorPicker folder. Follow the wizard by pressing"Next" button and finally press "Finish". A new .aspx page will be added to your project, depending on your choice in the Scenario Wizard. All necessary references will be added toyour project. Code library project of the Customizing the Advanced Template with RadScheduler populated with various data sources.